پاسدار, عماد, معرفت, مهدی, ذوالفقاری, سیدعلیرضا. (1391). تحلیل پارامترهای موثر بر آسایش حرارتی با مدلسازی انتقال حرارت و رطوبت از لباس. نشریه پژوهشی مهندسی مکانیک ایران, 14(4), 6-28. عماد پاسدار; مهدی معرفت; سیدعلیرضا ذوالفقاری. "تحلیل پارامترهای موثر بر آسایش حرارتی با مدلسازی انتقال حرارت و رطوبت از لباس". نشریه پژوهشی مهندسی مکانیک ایران, 14, 4, 1391, 6-28. پاسدار, عماد, معرفت, مهدی, ذوالفقاری, سیدعلیرضا. (1391). 'تحلیل پارامترهای موثر بر آسایش حرارتی با مدلسازی انتقال حرارت و رطوبت از لباس', نشریه پژوهشی مهندسی مکانیک ایران, 14(4), pp. 6-28. پاسدار, عماد, معرفت, مهدی, ذوالفقاری, سیدعلیرضا. تحلیل پارامترهای موثر بر آسایش حرارتی با مدلسازی انتقال حرارت و رطوبت از لباس. نشریه پژوهشی مهندسی مکانیک ایران, 1391; 14(4): 6-28. در اکثر مدل­های حرارتی بدن انسان فرض می­شود کلیه تعرق روی سطح پوست تبخیر شده و تاثیر لباس در نرخ تبخیر بواسطه جذب عرق لحاظ نمی­گردد. در این مقاله کمیت­های موثر بر آسایش حرارتی با مدلسازی مکانیزم­های موثر بر انتقال حرارت و جرم از لباس بخصوص تبخیر درون لباس مورد تحلیل قرار گرفته­اند. در بخش اول نتایج اثرات پارامترهای فیزیکی و ساختاری اصلی لباس بر نرخ تبخیر و تری لباس مورد حل و بحث قرار گرفته است، نتایج نشان می­دهد که این پارامترها تأثیر قابل توجهی بر عملکرد تبخیری لباس خواهند داشت. در بخش دوم معیارهای آسایش حرارتی انسان مورد تحلیل قرار گرفته است، نتایج بیانگر آن است که این کمیت­ها ارتباط بسزایی با شرایط محیطی و نوع لباس خواهند داشت. Jones, B.W., "Capabilities and Limitations of Thermal Models for use in Thermal Comfort Standards", Energy and Buildings, Vol. 34, pp. 653-659, (2002). Fanger, P. O., "Thermal Comfort Analysis and Application in Environmental Engineering", McGraw-Hill, New York, (1970). Gagge, A. P., Stolwijk, J. A. J., and Nishi, Y., "An Effective Temperature Scale Based on a Simple Model of Human Physiological Regulatory Response", ASHRAE Transactions, Vol. 77, pp. 247-262, (1971). ANSI/ASHRAE Standard 55, "Thermal Environmental Conditions for Human Occupancy", Atlanta, ASHRAE Inc. (2004). ISO7730. "Moderate Thermal Environments-determination of the PMV and PPD Indices and Specification of the Conditions for Thermal Comfort", International Standards Organization, (1994). 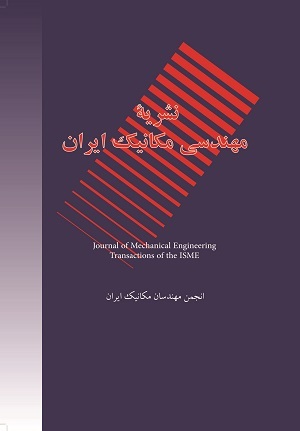 Zolfaghari, A., and Maerefat, M., "A New Simplified Model for Evaluating Non-uniform Thermal Sensation Caused by Wearing Clothing ", Building and Environment, Vol. 45, pp. 776-783, (2010). Fan, J., Luo, Z., and Li, Y., "Heat and Moisture Transfer with Sorption and Condensation in Porous Clothing Assemblies and Numerical Simulation", Int. J. Heat Mass Transfer, Vol. 43, pp. 2989-3000, (2000). Fan, J., Cheng, X., Wen, X., and Sun, W., "An Improved Model of Heat and Moisture Transfer with Phase Change and Mobile Condensates in Fibrous and Comparison with Experimental Result", Int. J. Heat Mass Transfer, Vol. 47, pp. 2343-2353, (2004). Wu, H., and Fan, J., "Study of Heat and Moisture Transfer with in Multi-layer Clothing Assemblies Consisting of Different Types of Battings", Int. J. Thermal Sciences, Vol. 47, pp. 641-647, (2008). Huang, H., Ye, C., and Sun, W., "Moisture Transport in Fibrous Clothing Assemblies", J. Eng Math, Vol. 61, pp. 35-54, (2007). Fu, G., "A Transient, 3-D Mathematical Thermal Model for the Clothing Human", Ph.D Thesis, Department of Mechanical Engineering, Kansas State University, (1995). Wang, Z., "Heat and Moisture Transfer and Clothing Thermal Comfort", Ph.D Thesis, Department of Mechanical Engineering, Hong Kong Polytechnic University, (2002). Patankar, S.V., "Numerical Heat Transfer and Fluid Flow", Vol. 5, Taylor& Francis. pp-197-197, (1980). Zolfaghari, A., and Maerefat, M., "A New Simplified Thermoregulatory Bioheat Model for Evaluating Thermal Response of the Human Body to Transient Environments", Building and Environment, Vol. 45, pp. 2068-2076, (2010). ASHRAE Standard, Chapter 8, "Thermal Comfort -ASHRAE Fundamentals", SI Version, (2001).